Read PSR National's response to the historic June 12th summit: "We hope the promise of denuclearization on the Korean Peninsula will inspire all nuclear-armed states to work towards the day when the world is rid of these weapons entirely." See coverage of our events with Prof. Vincent Intondi, author of African Americans Against the Bomb. See the recording of his talk at the University of WA here. ICAN wins the Nobel Peace Prize! Read our Press Release. In a huge victory for disarmament, the 2017 Nobel Peace Prize was awarded to the International Campaign to Abolish Nuclear Weapons. Read WPSR's press release here, and be sure to see the full statement from the Norwegian Nobel Committee. Decades after the Cold War has ended, the US is recklessly provoking a new nuclear arms race. Dr. Bruce Amundson and WPSR staff Lilly Adams were featured on Thurston County TV in June, 2017 to discuss our current situation, and talk about global and local movements fighting for solutions. "Doomsday clock reads two-and-a-half minutes to midnight"
Dr. Storey brings attention to the metaphorical Doomsday clock, which reflects the dangers to humanity posed by nuclar weapons and climate change. This year, scientists moved the clock to two-and-a-half minutes to midnight, the closest it's been to "Doomsday" since 1953. "Next president has a nuclear option: Scrap the program"
"We are looking for leaders who understand that nuclear weapons are immoral and must never be used. Nuclear weapons threaten genocide on a scale that decision-makers refuse to talk about." "We Are Pushing the Nuclear Fire Alarm"
Dr. Judith Lipton lays out the high-level risk of nuclear war humanity is facing due to the many nations (including the United States) who refuse to dial back their nuclear arsenals. 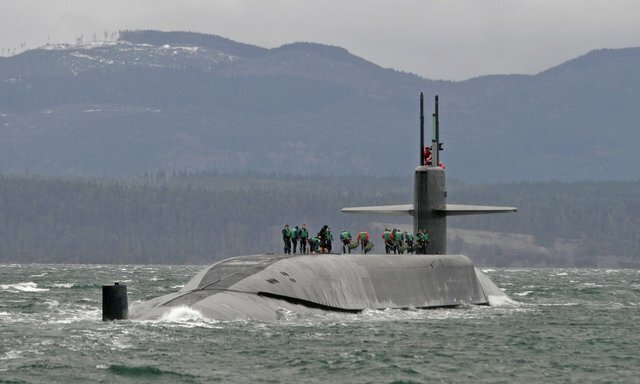 "Three minutes to midnight no time to rebuild Trident missiles"
Dr. David Hall explains that America is fueling a new nuclear arms race by updating its nuclear arsenal, including the Trident warships in the Puget Sound.